Icesicles - 3d stickers from my stash, old don't know the maker. Embossing powder and did the boots in Detail Black. Thanks for visiting today and please come back again when time allows. Please leave me a comment on you opinion of my creation. Pretty Pretty card Judie. I love your image. This is really nice! 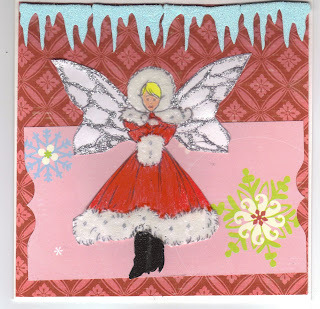 We're happy to have you join us for this weeks Christmas card challenge! Can I ask that you please link the direct post for your Christmas card on the blog and not just your general blog address? If you're unsure how to do so, there are directions on our blog. This is really well done, I'm glad you sent me your link - love the color combo! Wow, what a gorgeous card, I love the fairy, her wings are awesome. Her red dress in=s gorgeous. What a fabulous furlined outfit she's wearing ... wouldn't mind one of those for our chilly winters up here North of the Border LOL! Wow, such a gorgeous card! I love it! Thank you for playing along with us at Christmas Stampin All Year Long! You did a wonderful job with this week's designer paper challenge!! Hope to see you playing along with us again! We have a fun challenge this week! !